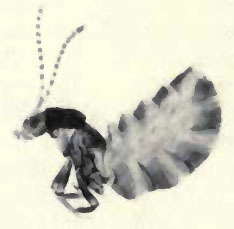 Termitogaster insolens, from Seevers (1957). The Termitogastrina are a lineage of physogastric staphylinids found in association with nasutitermitine termites of the genera Nasutitermes, Trinervitermes and Grallatotermes. Though difficult to characterise as a whole due to the derived morphology of some genera, but all carry the variously inflated abdomen recurved over the foreparts. In less derived species, the tarsi are 5, 5, 5-segmented, albeit with the fifth segment partially fused and not movable relative to the fourth segment; in some derived species the tarsi have become 4, 4, 4-segmented. These species have the sixth and seventh tergites characteristically enlarged with the seventh tergite shield-shaped (Seevers 1957).